This is book 7 in a series, so don't be surprised if I talk about plots in earlier books. 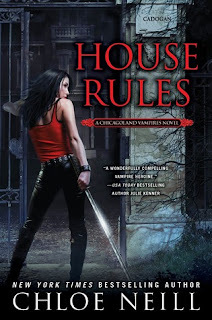 If you're not update on the series you may want to come back and read my review once you've read House Rules. I'm going to be honest... I've not been in love with Chicagoland since Drink Deep. No, I did not "die" after Hard Bitten ending with Ethan's death. I don't mind a main character dying if it adds to the over all plot of the series. I felt like his death was done well and had meaning. But I hoped that the back and forth, we can be together, no we can't BS was done. Nope. So I dragged my feet starting House Rules because this issue was still playing out in Biting Cold and I really didn't want more of Mallory. After she went all Willow (from Buffy the Vampire Slayer) I don't care about her. I want her gone. After being told about others that House Rules has more of a feel that the early books has I was like ok, it's time to finally read it. It took me almost two weeks to finish it. Why? I just couldn't get into until about the last quarter of it and then I stayed up late to finish it. Does it feel like the earlier books? NO. But I was happy to see that we got little of Mallory in this installment. And it seems like Ethan has FINALLY made up his mind to stand up for his relationship with Merit and back her 100%. I feel like House Rules should have came after Drink Deep and could have skipped Biting Cold. I think Chloe Neill has finally brought the series back around to where I can be excited about it again. I'm actually looking forward to Biting Bad and even more so for Wild Things since by the cover it looks like we will get more of the werewovles. I've been struggling with this series for a while now too but I really think that Chicagoland Vampires has reached a turning point. Hopefully for the better. Good review. Agree on your assessment. The concept and ideas behind the book are good and high entertainment but did seem to be off track for a bit but do enjoy Chloe Neills writing. I totally agree. This book was definitely better then the last few. But I do hope it ends soon, I don't want it to be dragged out where I get bored and quit before it's over.